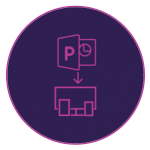 Fast-forward to smart eLearning authoring by importing PowerPoint presentations to Adobe Captivate with just a few clicks. Transform static PowerPoint slides into mobile learning content that works seamlessly across all devices. Enhance the learning experience by adding interactive elements, assets and quizzes. Now you can easily add Microsoft PowerPoint slides to your mobile learning projects in HTML5 and Captivate will automatically handle the sizing and orientation issues common in mobile device display. This functionality is only available on Windows platform. To begin, create a new Responsive Project. This will create a new HTML5 project that is ready to be consumed on mobile devices. Go to the Toolbar and click Slides > PowerPoint Slide. 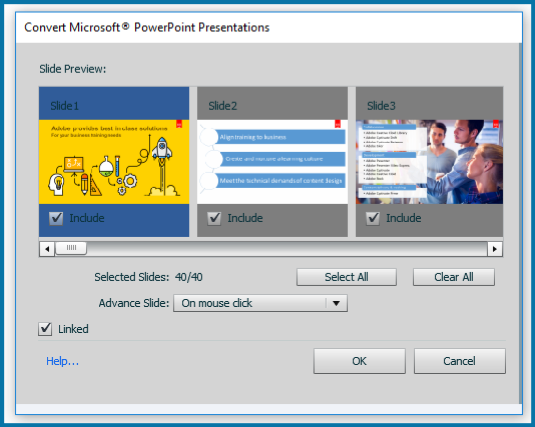 A dialog will appear to allow you to pick where in the current project you would like the PowerPoint slide(s) to appear. You can always move these around later. Next a system dialog will prompt you to point to the PowerPoint file, and finally a dialog will appear that will allow you to select the slides you wish to import. Now you may select / deselect any of the slides that you want to include inside your project. If you want the slides to advance on a mouse click, then just click OK. If you want, you can also change that to make the slides play continuously like a movie. The linked option determines whether Captivate will remain linked to your external slide deck (leave this linked if you want to be able to easily update your deck from a shared external source.) If you do not leave the deck linked, Captivate will embed the deck inside its authoring environment, making a duplicate of the original. Once the PowerPoint slides are added. Go to the Toolbar and click Preview > Project to preview the project. Adobe CaptivateAdobe Captivate 2019blogmobile LearningPowerPoint importResponsiveResponsive eLearningWhat's new? Can you add quiz questions to a linked PowerPoint presentation?